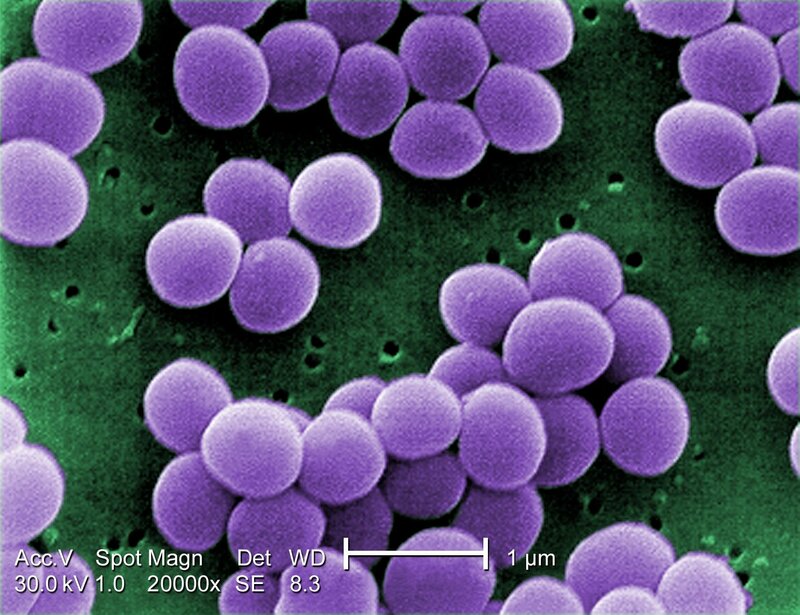 False-colour electron micrograph of Staphylococcus aureus, from the Centers for Disease Control and Prevention. Staphylococcus is a genus of coccoid, facultatively anaerobic bacteria found in a variety of habitats including the skin and other membranes of animals, and in soils. They are characterised by the production of catalase, and of grape-like clusters when in culture. IJSEM. 2003. Validation list no. 89. Validation of publication of new names and new combinations previously effectively published outside the IJSEM. International Journal of Systematic and Evolutionary Microbiology 53: 1–2. Kwok, A. Y. C., & A. W. Chow. 2003. Phylogenetic study of Staphylococcus and Macrococcus species based on partial hsp60 gene sequences. International Journal of Systematic and Evolutionary Microbiology 53: 87–92. Spergser, J., M. Wieser, M. Täubel, R. A. Rosselló-Mora, R. Rosengarten & H.-J. Busse. 2003. Staphylococcus nepalensis sp. nov., isolated from goats of the Himalayan region. International Journal of Systematic and Evolutionary Microbiology 53: 2007–2011.